Cliff developed an interest towards cooking since young, and he started working at the kitchen of a Western restaurant in his teens. However, perhaps because of the many Thai friends he had, there was always a je ne sais quoi in Thai cuisine that fascinated him. As a result, he went on to learn cooking Thai food a year later, and subsequently joined the Thai restaurants in Sydney, London, Bangkok, Singapore and Hong Kong. During his time working in Bangkok a few years ago, Cliff felt his career came to a bottle neck. Just as he was going to go back to his home in Sydney, a ten-day vacation he had had in Hong Kong propelled him to make alternative plans. “It might be a cliché to say Hong Kong is an East-meets-West city, but it is something really charming. For instance, such influence of Western culture can’t be found in Bangkok,” Cliff said. An opportunity was presented in front of him. Cliff was approached to take charge of a Thai restaurant in Hong Kong. He took up the challenge and ran with it. In 2016 saw another turning point of his professional life, as he decided to open a restaurant of his own. The beginning of this new project was far from straight forward. He scoured every district in town to find the best location. “I never thought it would be that difficult. We spent a year and a half viewing more than 200 shops,” he said. Samsen is located near the Blue House in Wan Chai, a Grade I Historic Building. It was no easy feat for Cliff to find somewhere that satisfied his preferences for location, rent and kitchen space. But once he made up his mind with the spot where Samsen is now situated, he fell in love with it immediately. “This was actually one of the first locations I viewed. After so much hassle I decided to come back here. Everything just clicked together. I love Wan Chai. It’s a hybrid of the affluent and authentic, the local and foreign, new buildings and historical architecture. The convenient transportation setup makes for a diversified circulation of people. But being in an old district, we have many elderly customers. It makes me the happiest to see them like our food. They’ve eaten for so many years. The quality of food is all they care. It’s not easy at all to earn their recognition!” Cliff said. Interestingly, the restaurant is frequented by patrons from different demographics at different times. “Locals usually come during the lunch time. The same goes for the dinner from Monday to Wednesday. Foreigners mostly come in groups between Thursday and Saturday,” he noted. Wagyu beef boat noodles, Samsen’s signature dish. Taking advantage of the network he built in Bangkok, Cliff is ahead of the game when it comes to sourcing produce and spices. “I have very good suppliers from Bangkok, and I know the market there very well. I can tell them to get ingredients from a specific shop at a specific market. These local produce and spices are crucial to serving delicious dishes here,” he said. Samsen’s kitchen is an international bunch, with members from Hong Kong, Indonesia, Malaysia and Thailand. Among them, only the sous chef had previous experience working with Cliff from when they were in Sydney. The rest was recruited as the shop was under construction. Despite the difference in language and cultural background, Cliff emphasised they share one thing in common: the will to make it work and cook up wonderful cuisine. The fried pork collar at Samsen. Speaking of Thai cuisine, many diners automatically assume that all dishes come with a scale-breaking level of heat. It’s not entirely true. Samsen offers a good amount of options on the less fiery side. 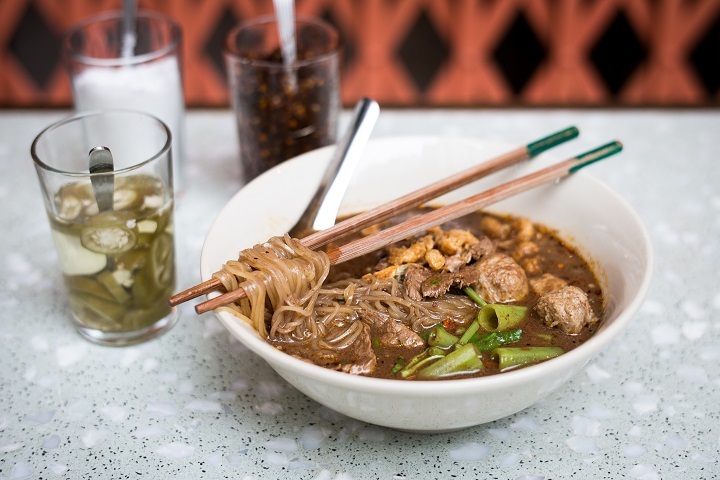 Spice junkies can have their fix in dishes like wagyu beef boat noodles. But the zing the spices provide is just a part of the show. Sweetness, acidity and aroma all play important roles to deepen the dishes’ flavours. The Pad Thai with tiger prawns and stir-fried flat noodles with sliced chicken are some of the items in which the mouth-burning sensation takes a back seat. The heat of the spices is secondary to the fragrance they release. 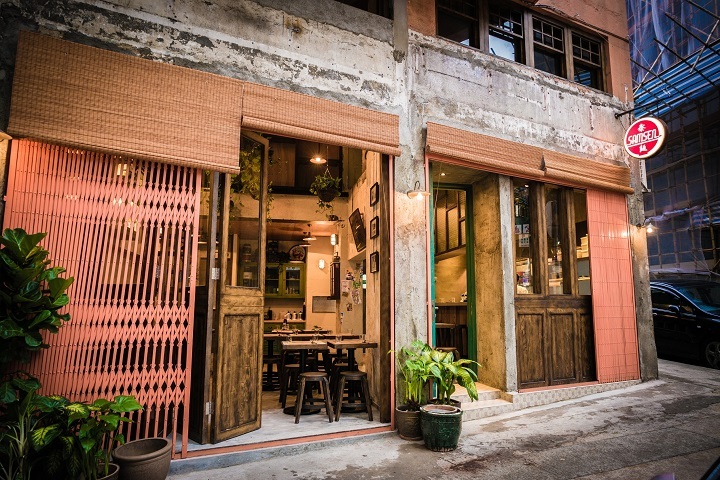 In addition, due to the proximity of the dining area to the kitchen, Samsen is able to recreate a trait vital to Thai street food: serving the dishes sizzling hot right after they’re cooked. Every type of noodles here is properly heated and evenly seasoned without sticking. Unlike the green papaya salad in many Thai restaurants, Samsen gathers all the rare spices from Thailand to ensure its version doesn’t deviate from the original counterpart. The same goes to fried pork collar. The calamansi lime and salted plum soda as well as Thai iced lime tea taste no different than the drinks you can find at a Bangkok market, contained in a plastic bag. Samsen was crowned as a Bib Gourmand restaurant for the first time in the MICHELIN Guide Hong Kong Macau 2018, and has retained the recognition in the 2019 edition. Cliff was overtaken by surprise when he learned about the news. This article was written by Clarence Chan and translated by Vincent Leung. Click here to read the original version of this story. Some of the biggest names in Hong Kong’s dining scene are beating a path to success in Singapore.